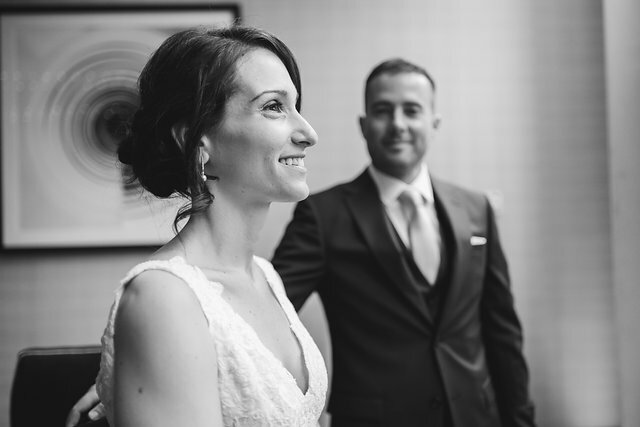 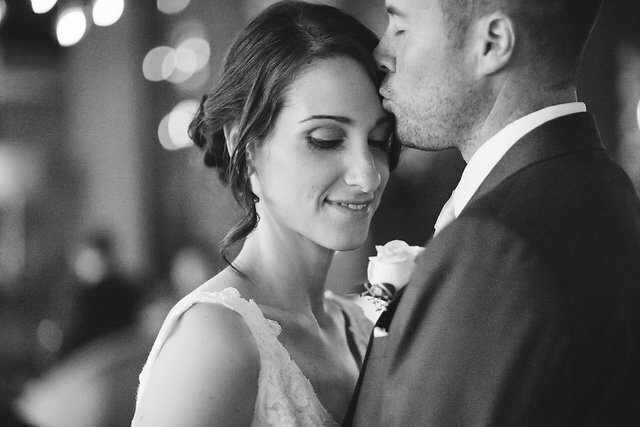 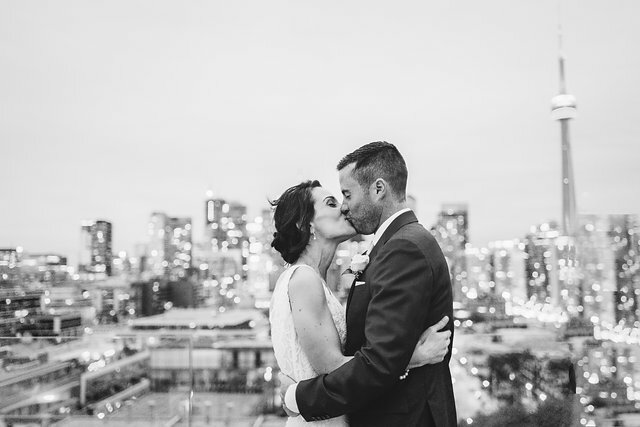 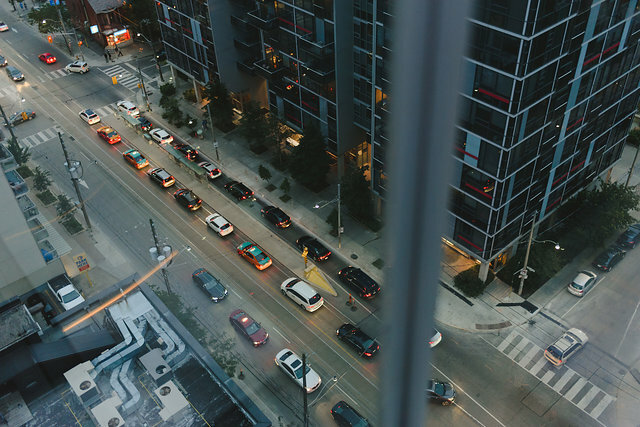 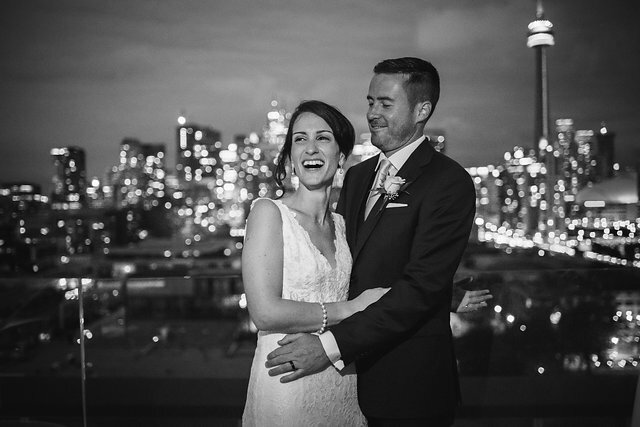 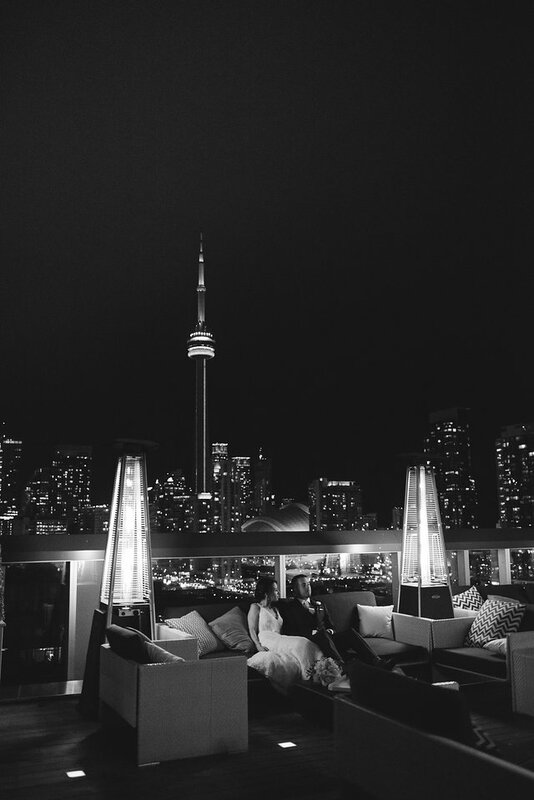 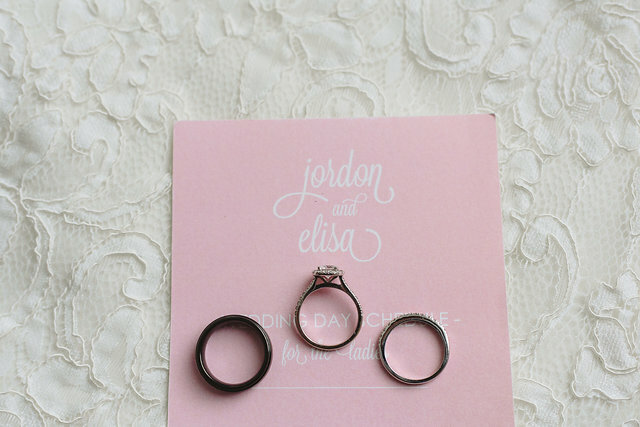 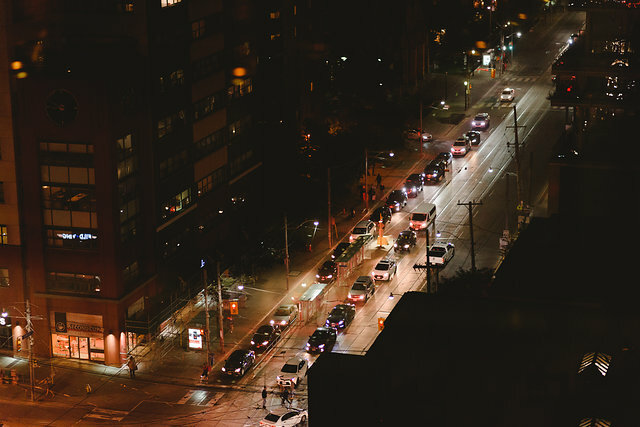 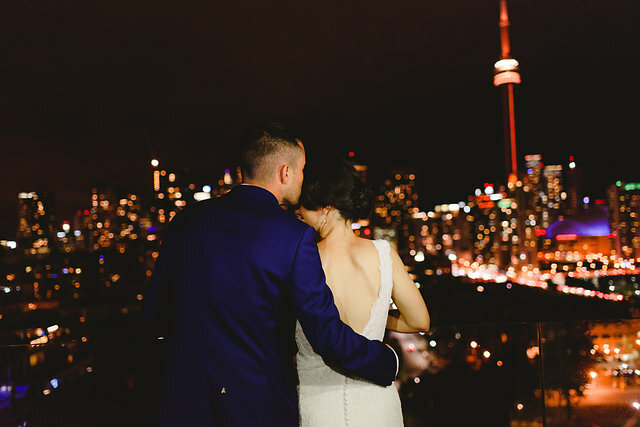 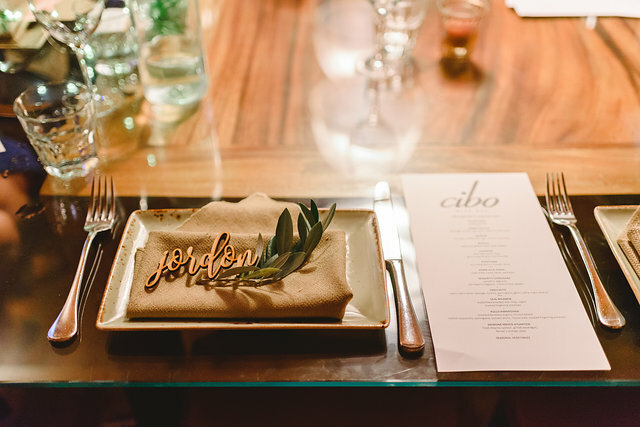 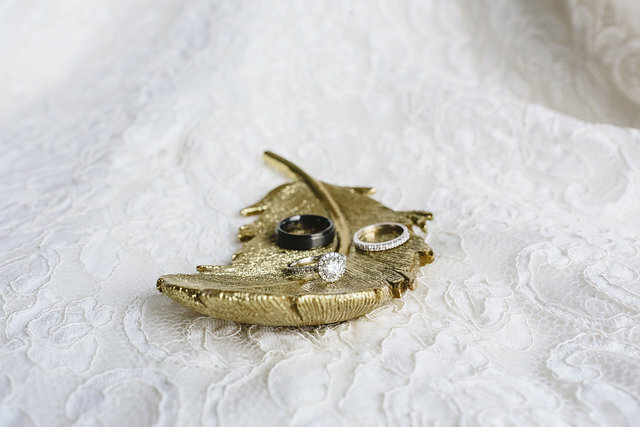 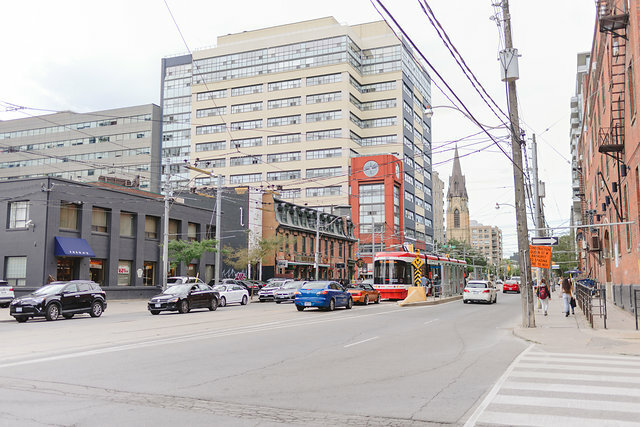 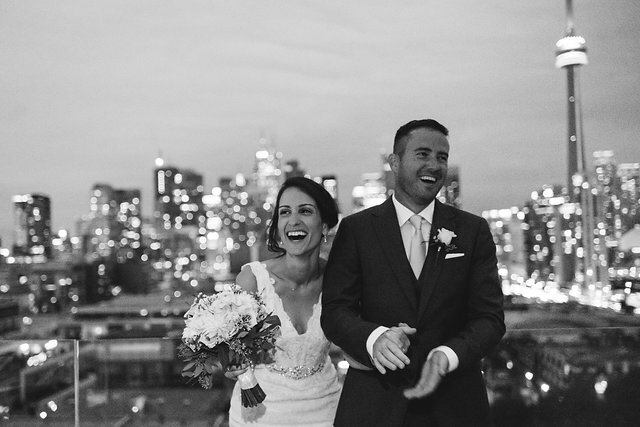 During our first meeting Elisa and Jordon told me they wanted an intimate Toronto wedding. 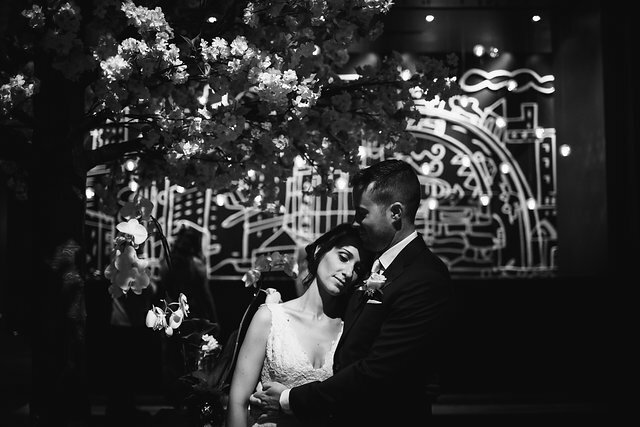 They wanted the day to feel relaxed and unfussy. 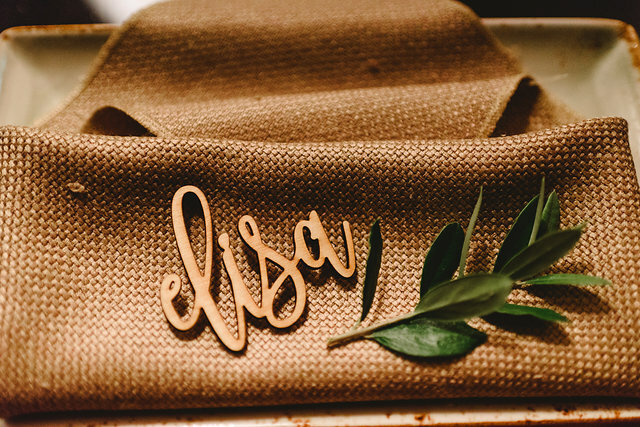 Elisa started the day with a trip to the spa with her family. 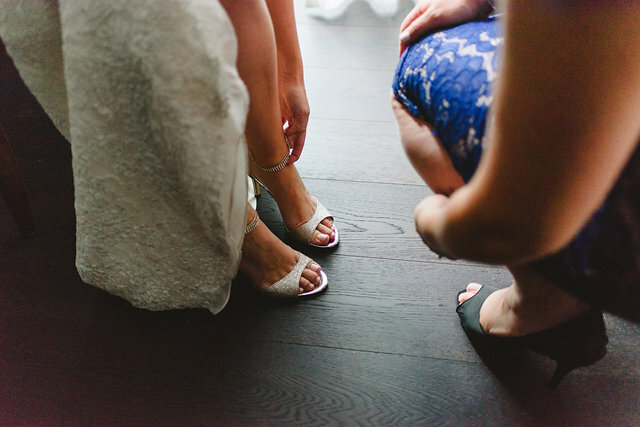 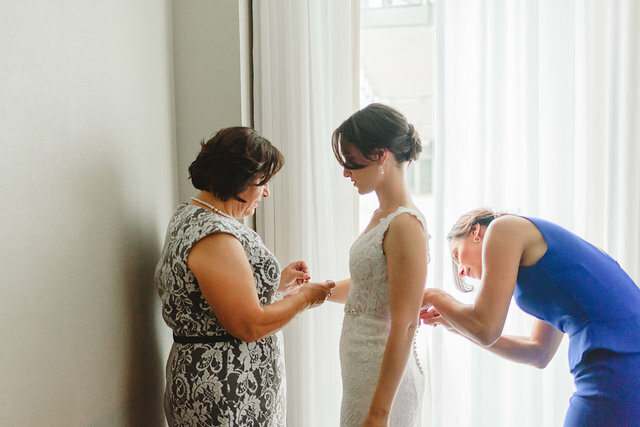 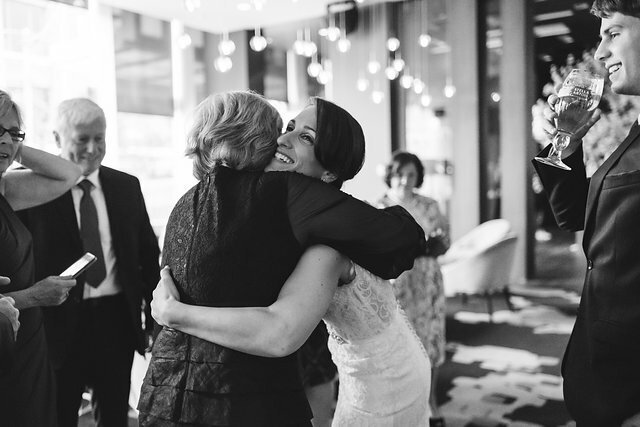 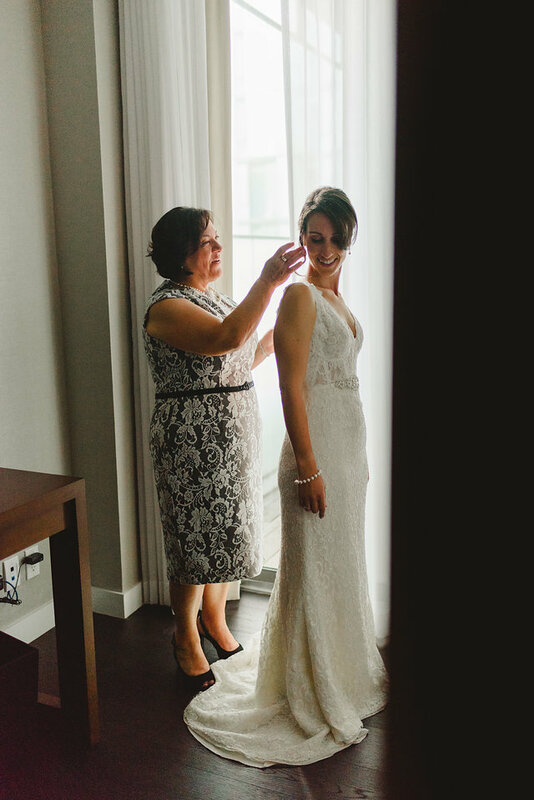 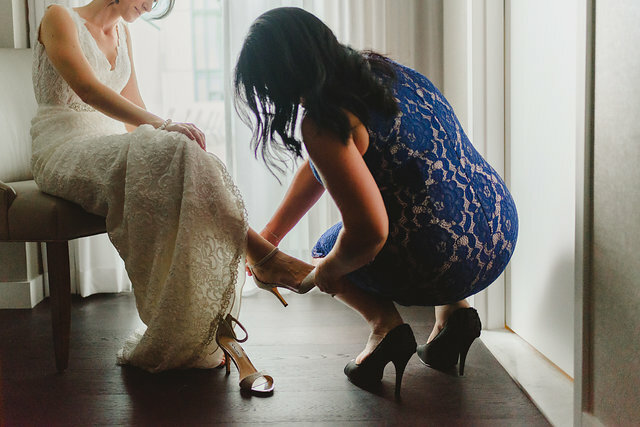 Afterwards she got ready at the Thompson hotel where her mom and sisters helped her get dressed. 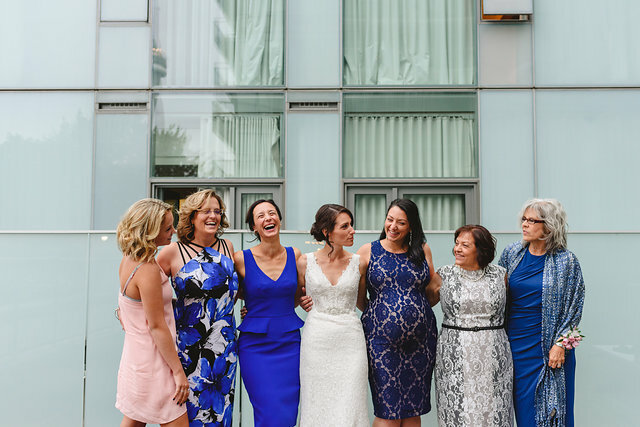 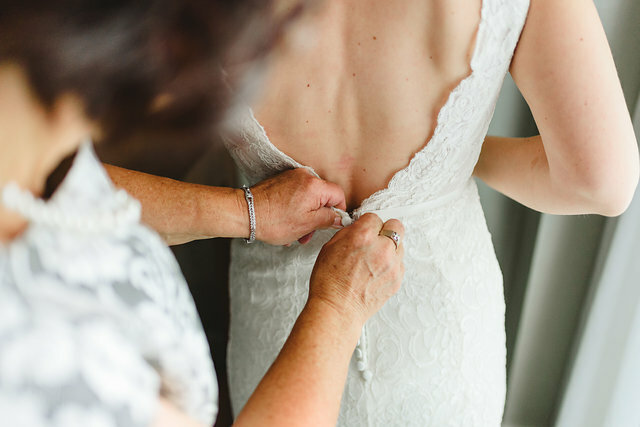 Although the bride and groom decided not to have a bridal party, all the female guests surprised them by wearing blue dresses and the all the male guests wore superhero tee shirts underneath their suits. 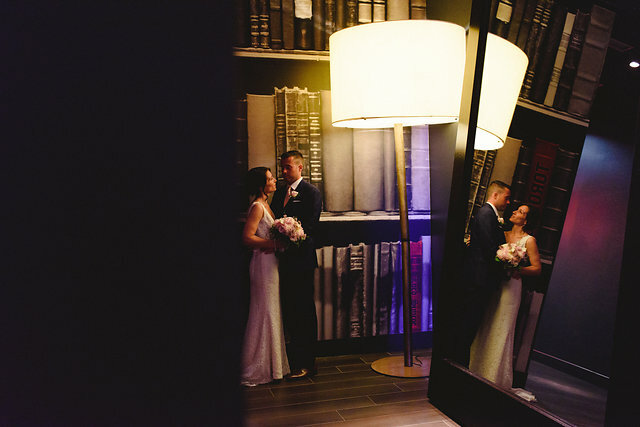 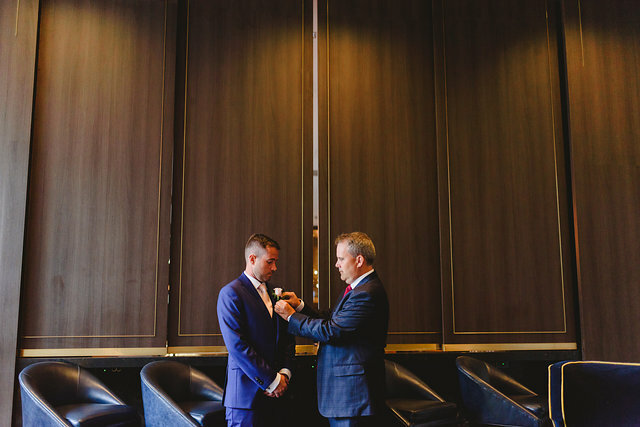 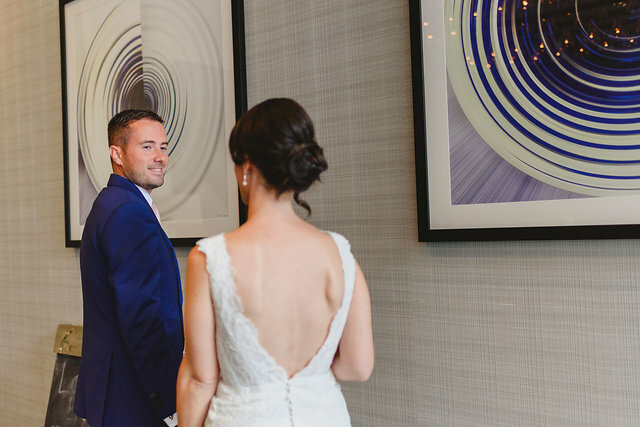 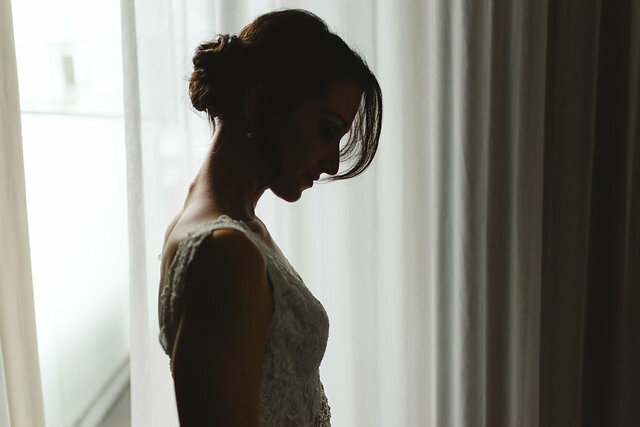 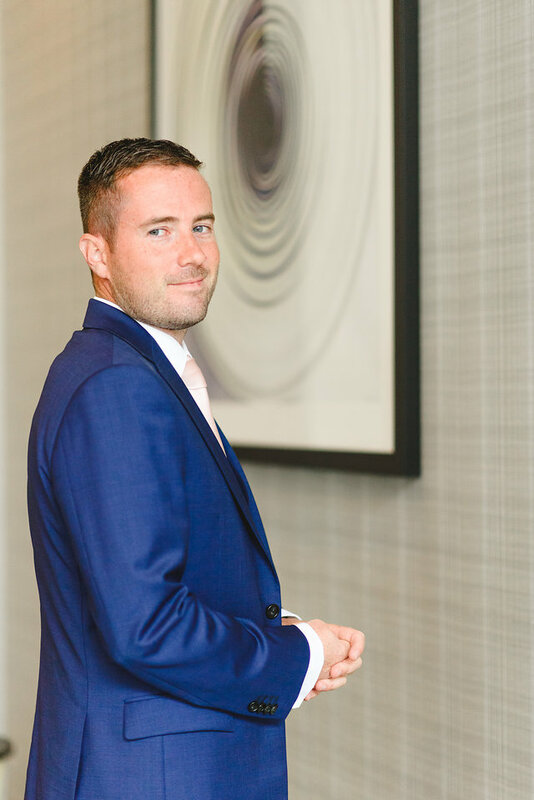 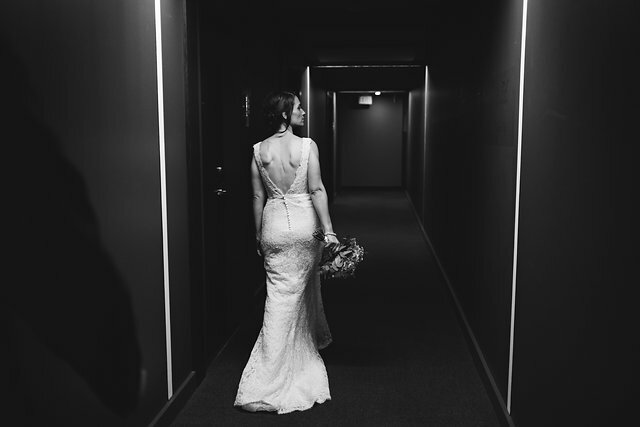 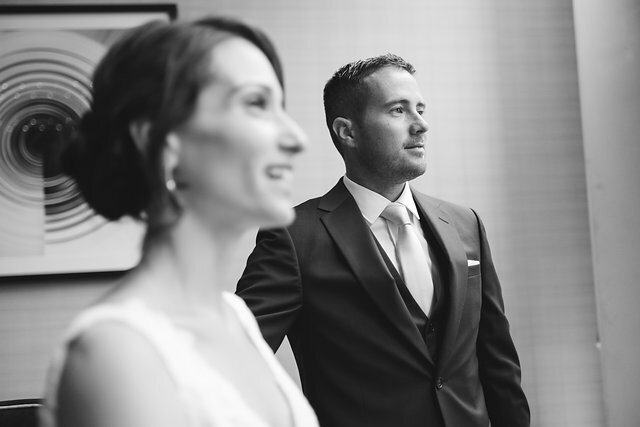 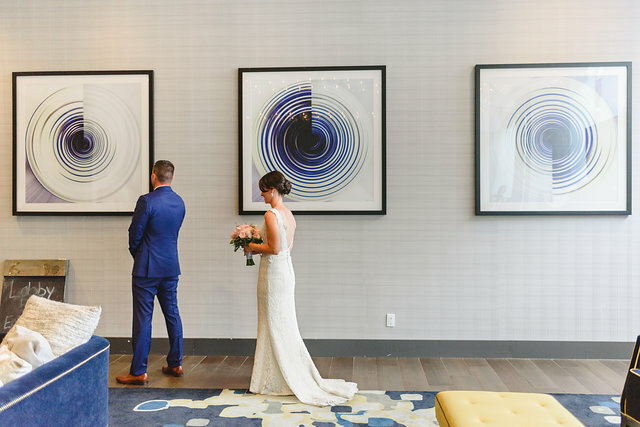 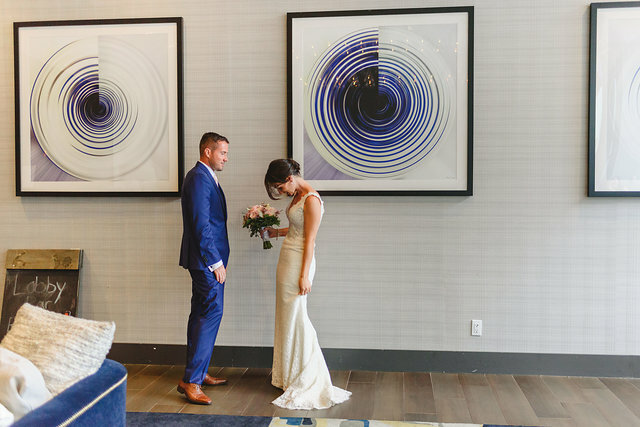 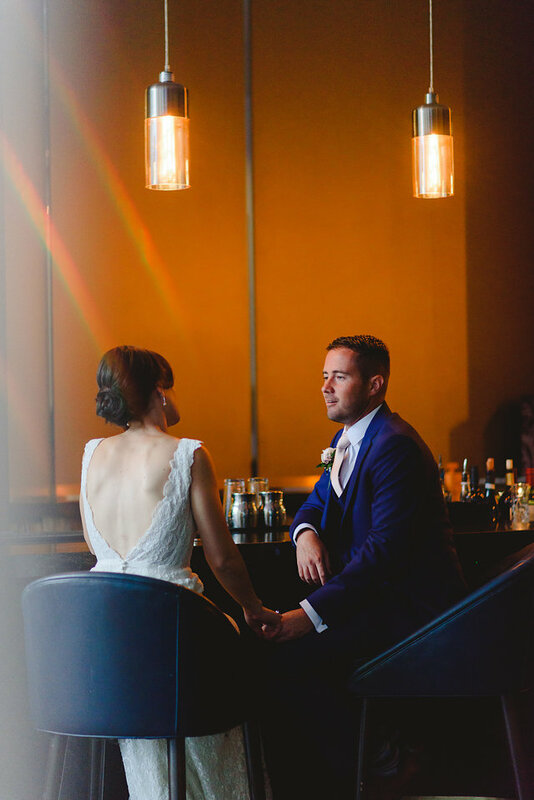 For the first look Jordon waited in the blue room of the Thompson hotel while Elisa snuck up behind him. 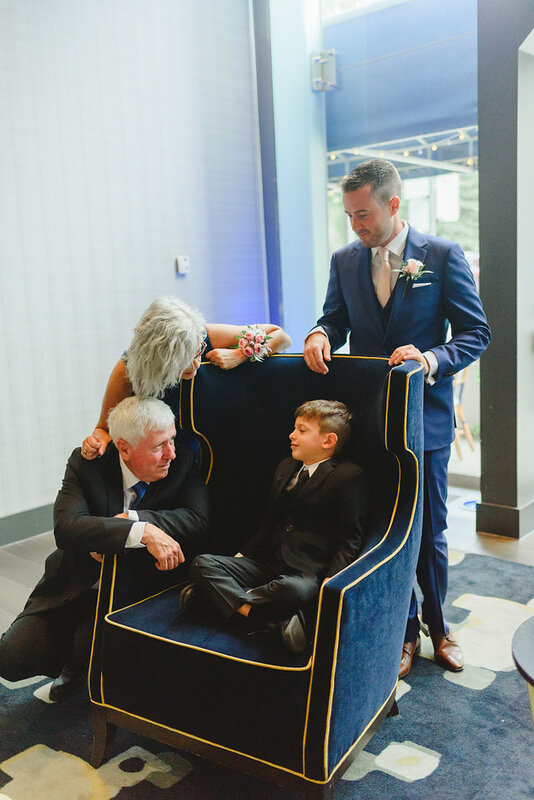 Their family stood by the doors and cheered when Jordon turned around. 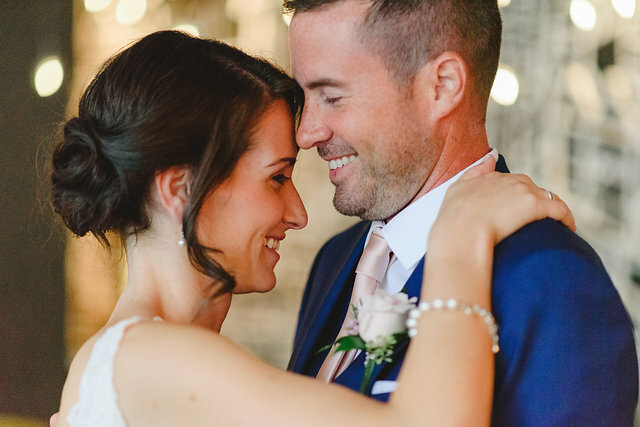 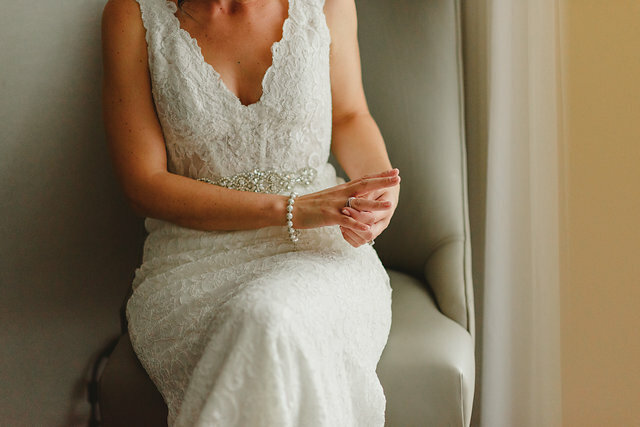 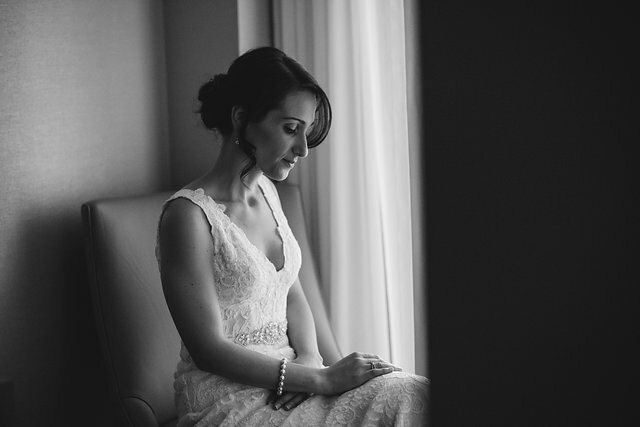 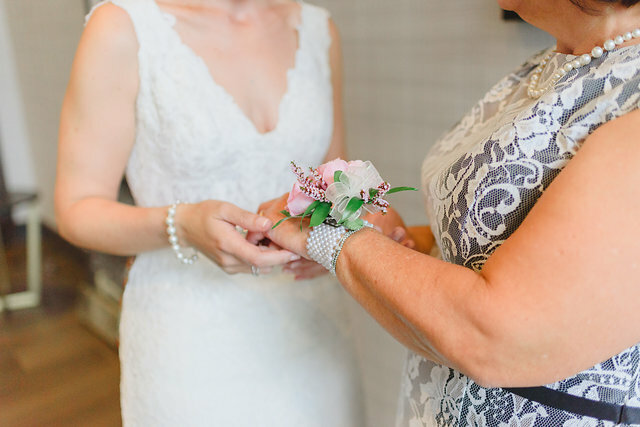 Jordon lovingly told Elisa how beautiful she looked and continued to stare at her all throughout the day. 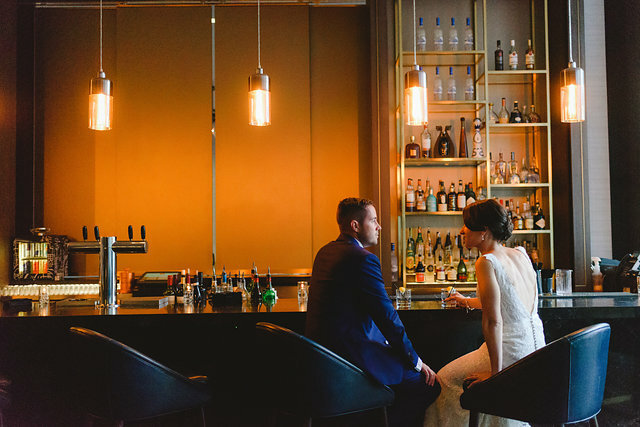 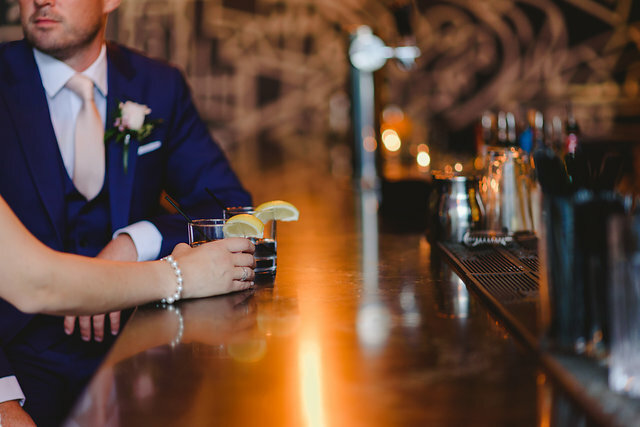 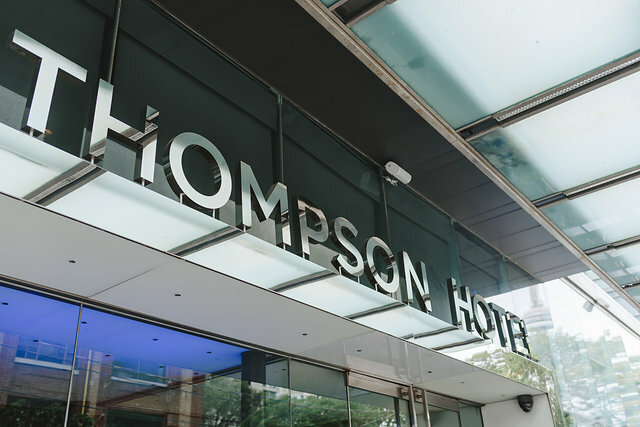 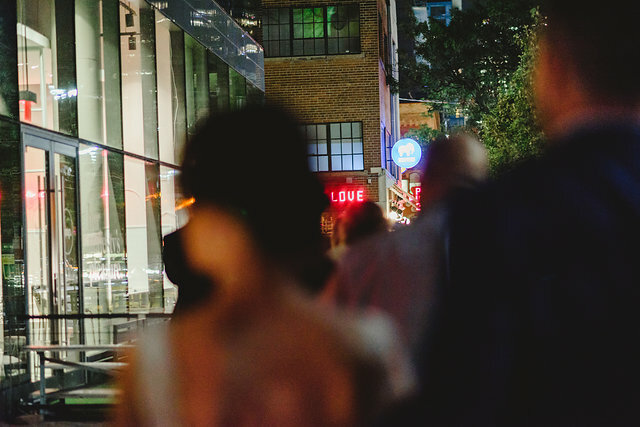 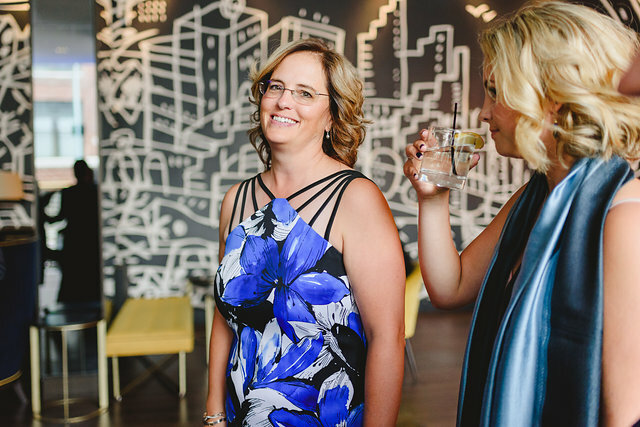 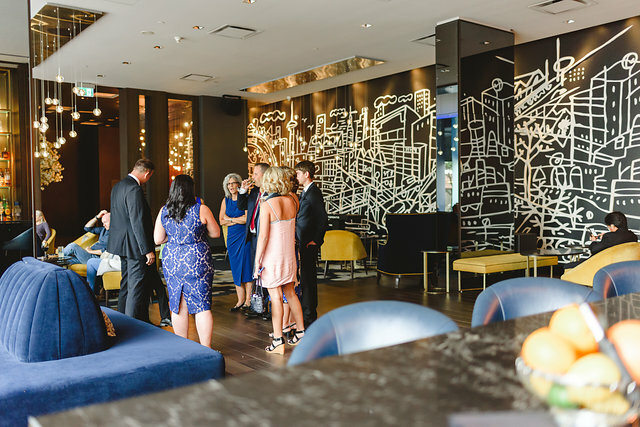 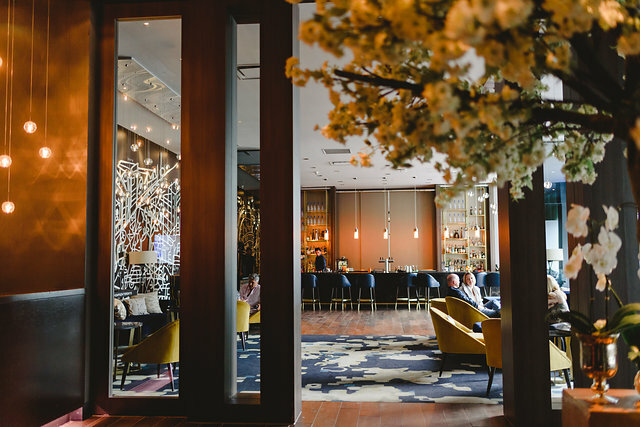 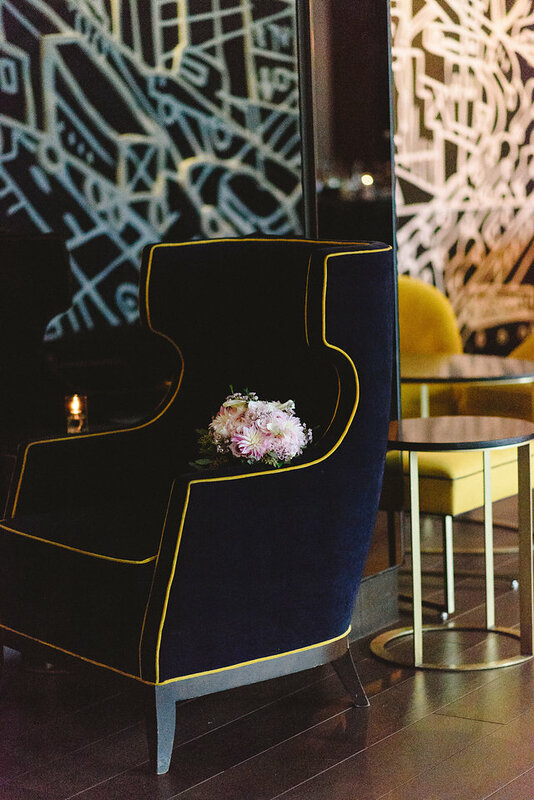 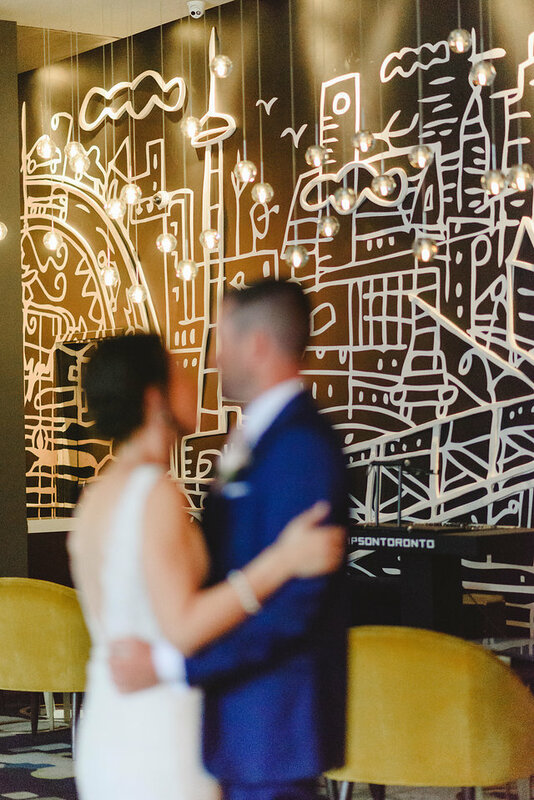 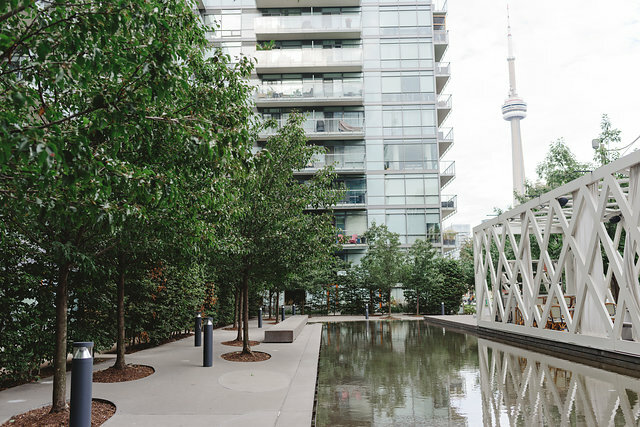 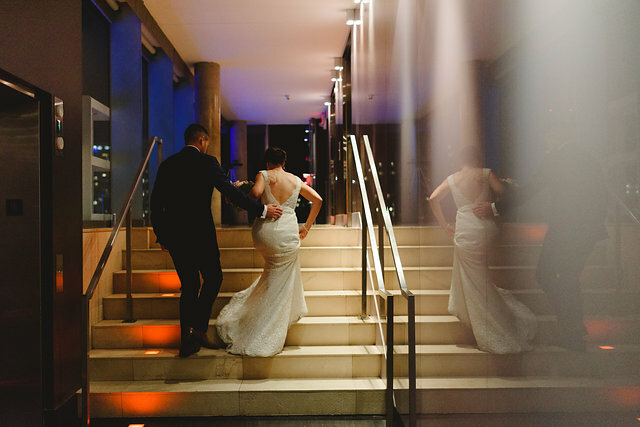 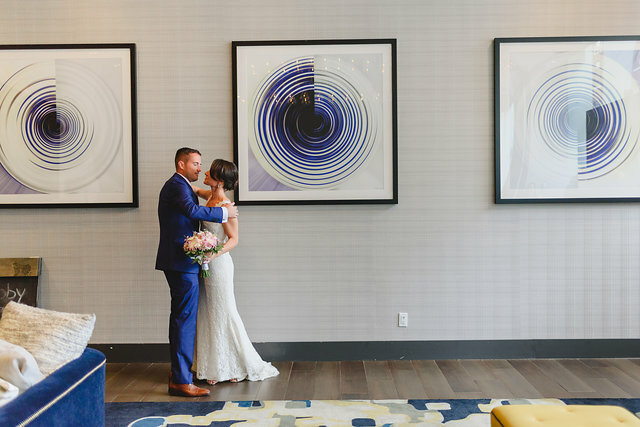 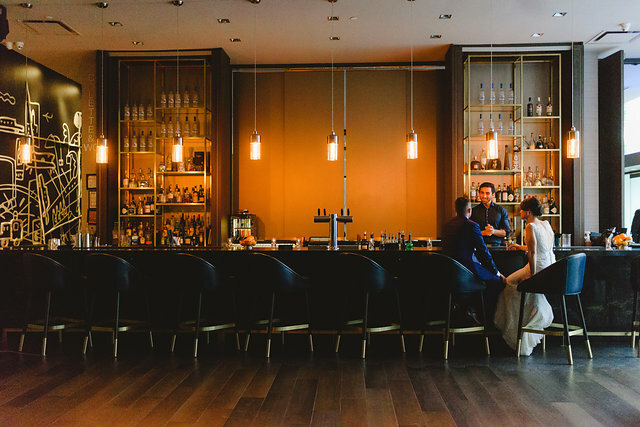 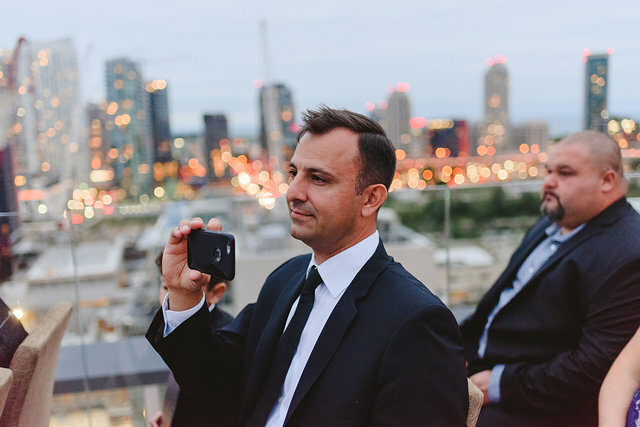 The Thompson hotel provided a number of creative backdrops so we walked explored and photograph their bride and groom session all over the hotel. 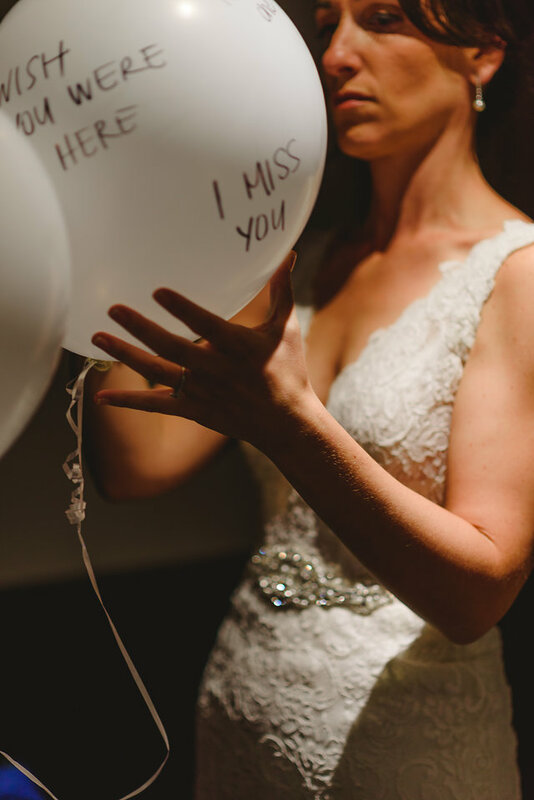 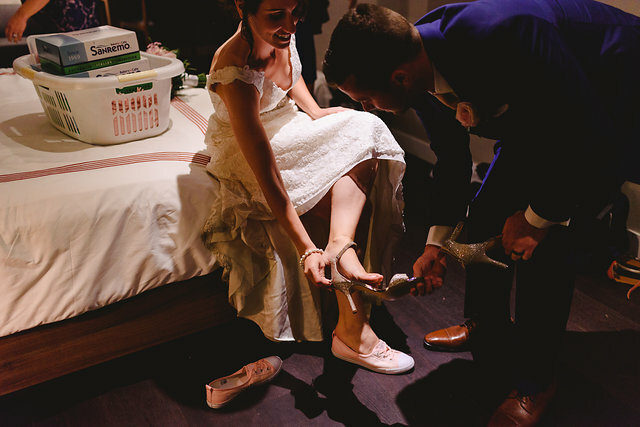 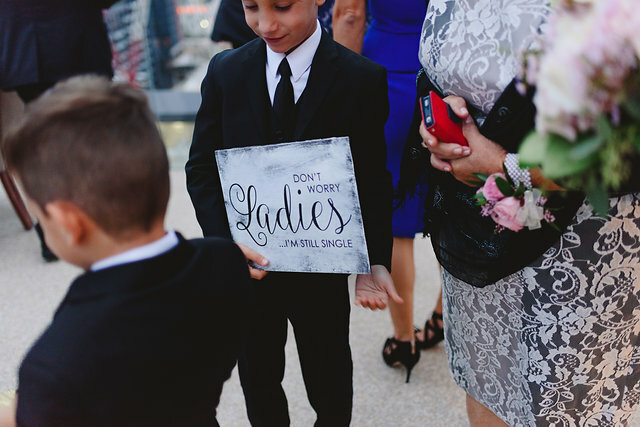 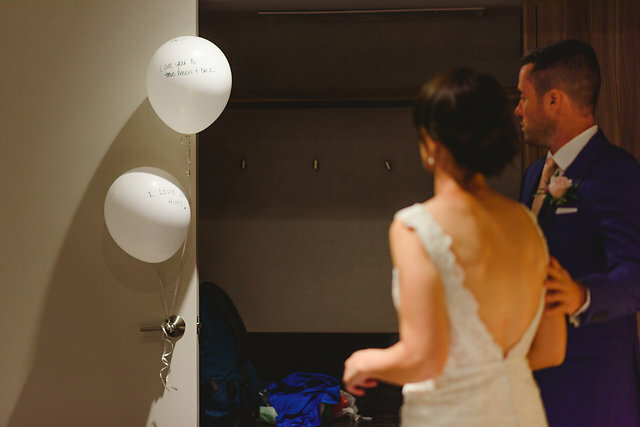 To commemorate her Dad, Elisa and Jordon wrote him a message to let him know they were thinking of him on their wedding day. 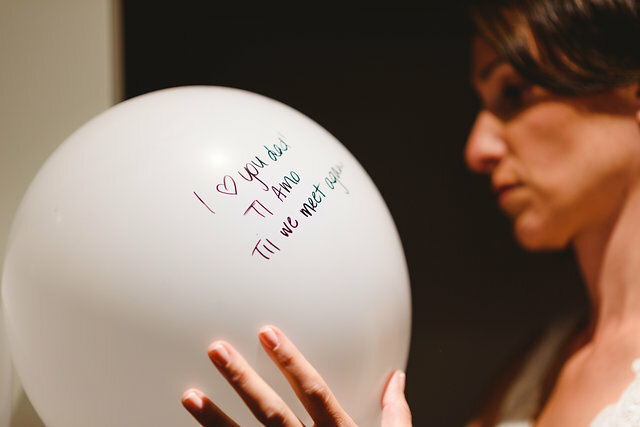 Elisa’s wrote a few phrases in Italian including “I miss you” and Jordon wrote “I miss you more” on their balloons. 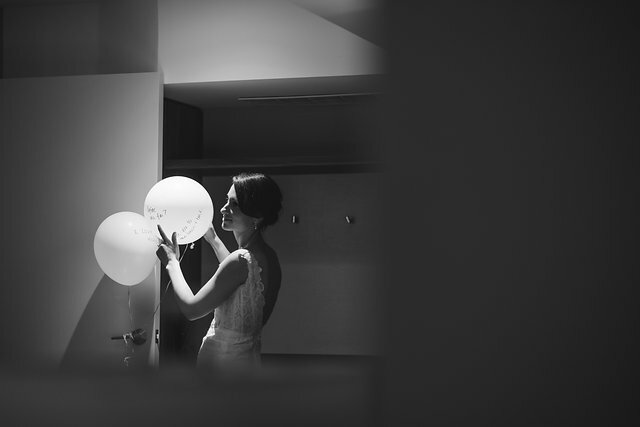 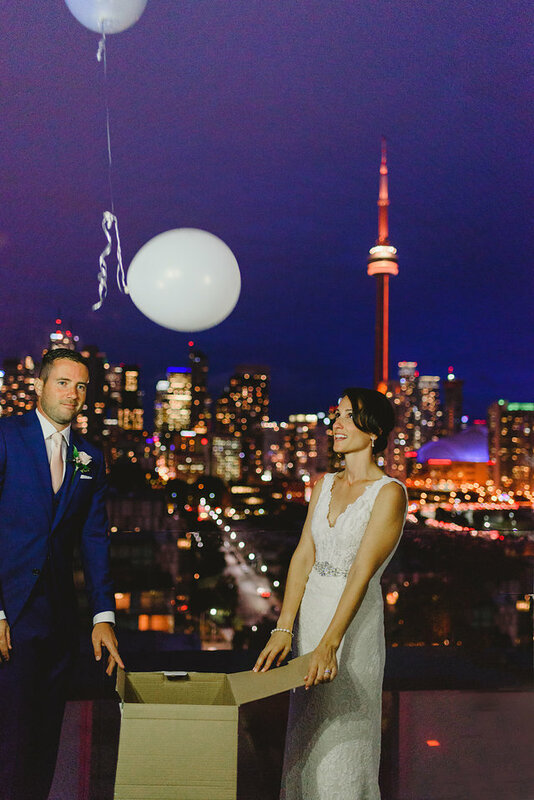 After the ceremony they brought the box of balloons forward and released them into the night sky. 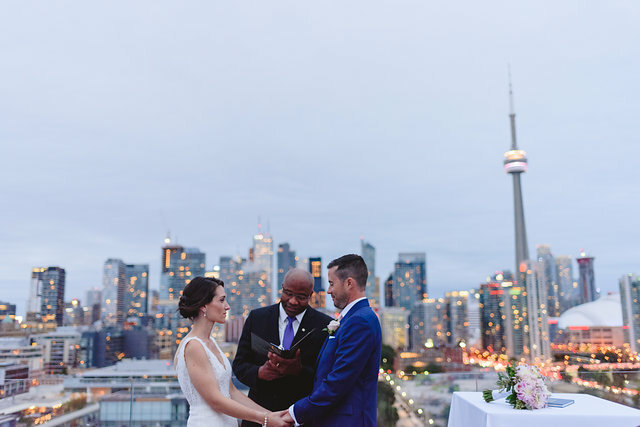 Initially they had planned for a sunset ceremony over looking the city, but the weather had other plans. 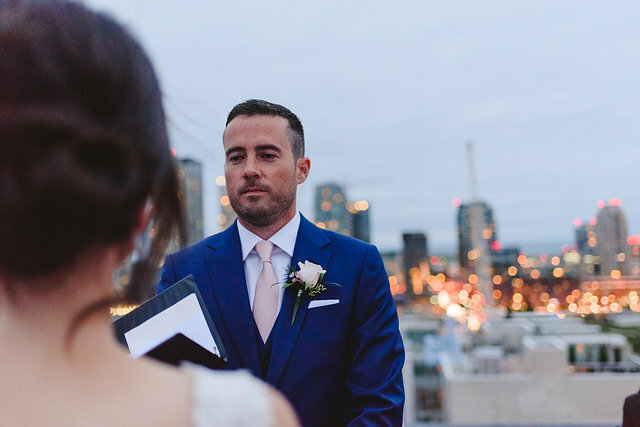 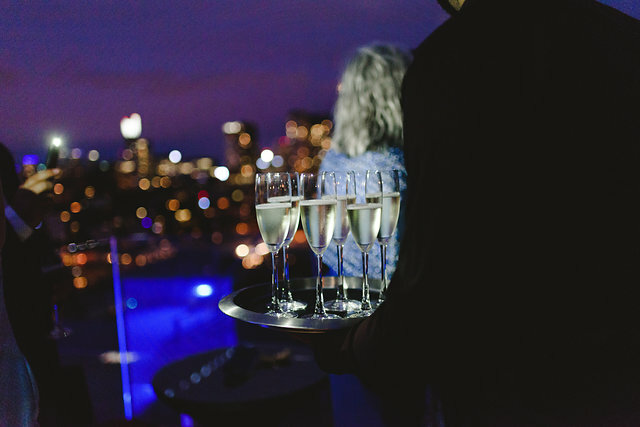 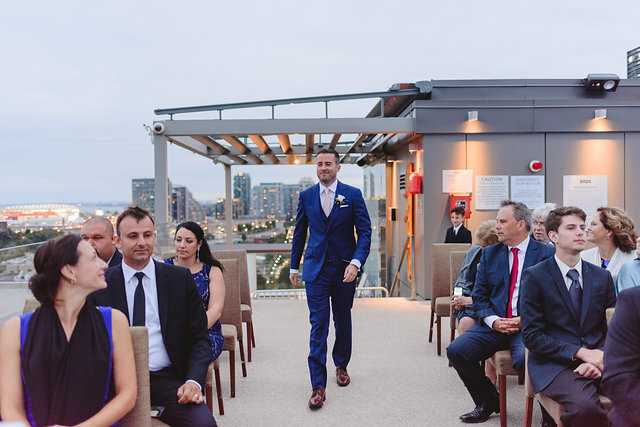 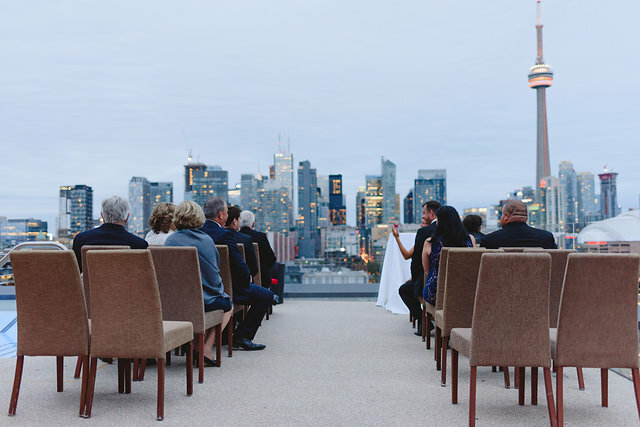 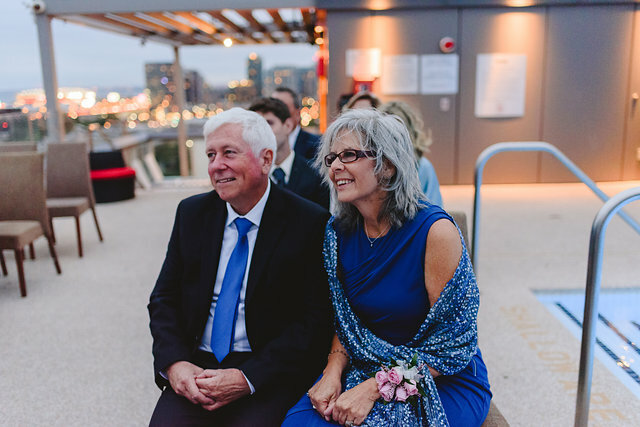 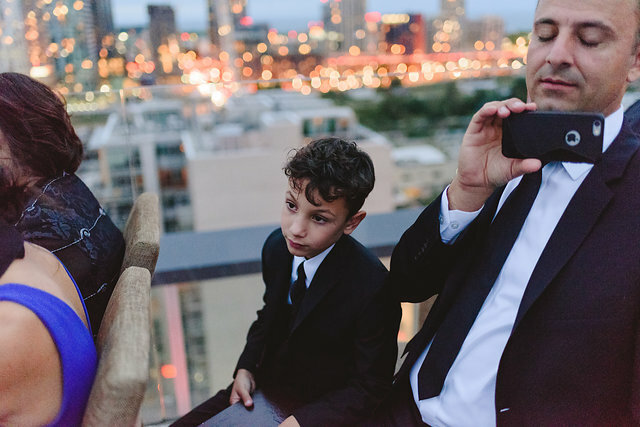 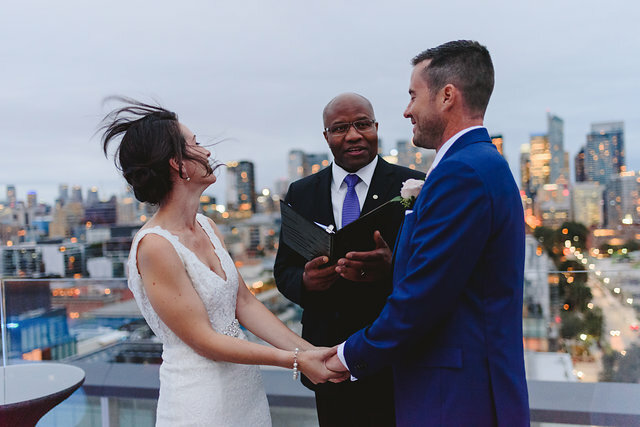 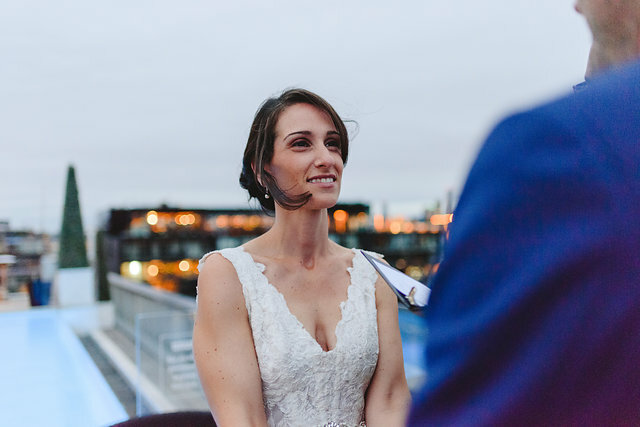 As the ceremony began the sky quickly turned from grey to blue on the rooftop of the Thompson Hotel. 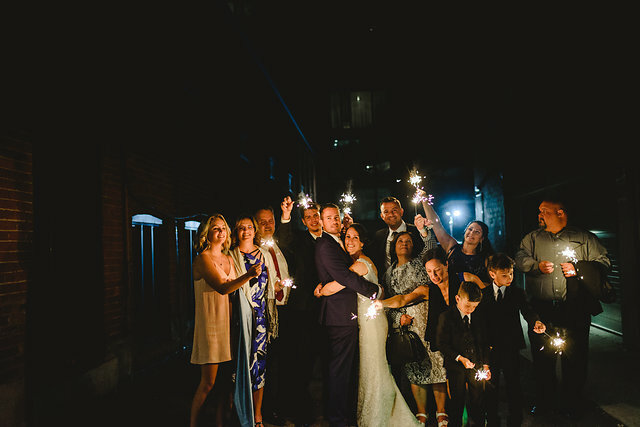 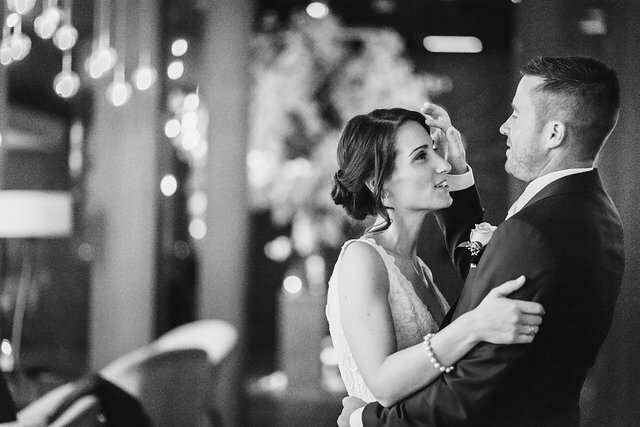 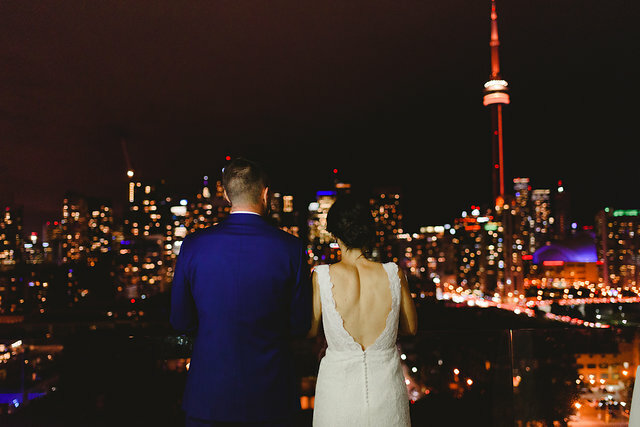 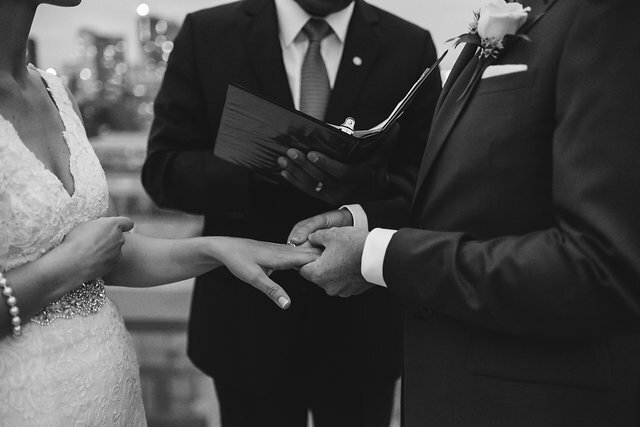 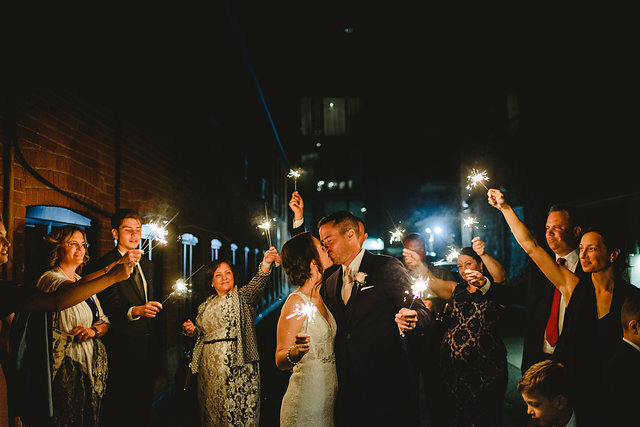 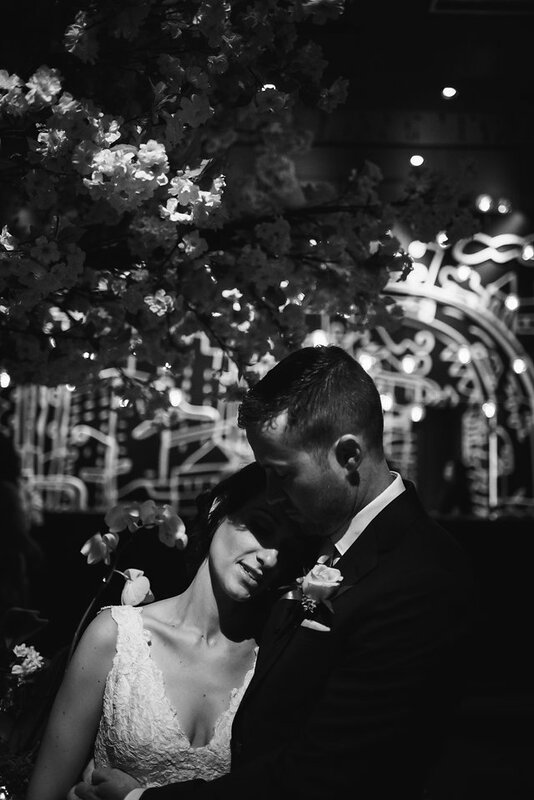 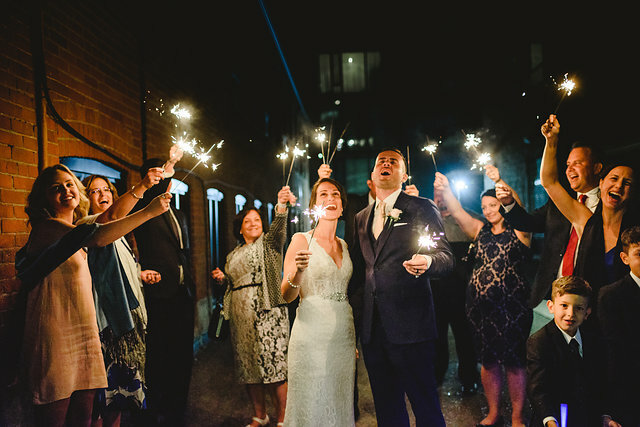 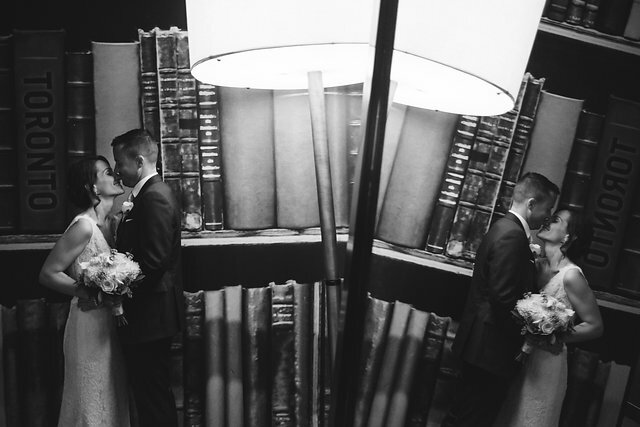 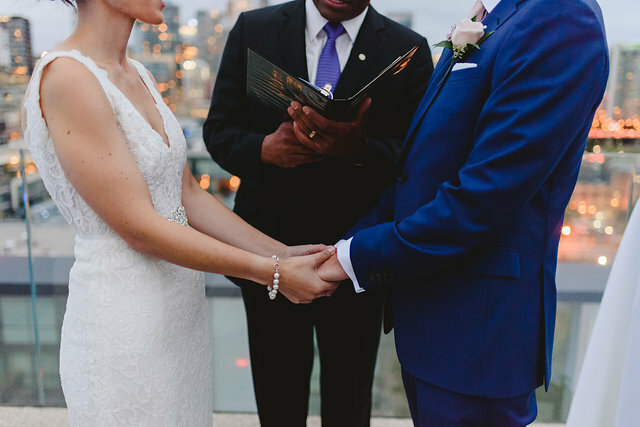 As they stood in-front of each other reciting their vows the city lights lite up behind them. 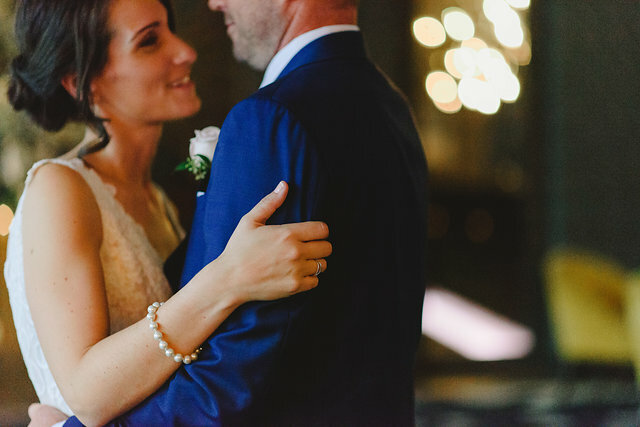 Their friends and family looked on with smiles as they promised each other forever. 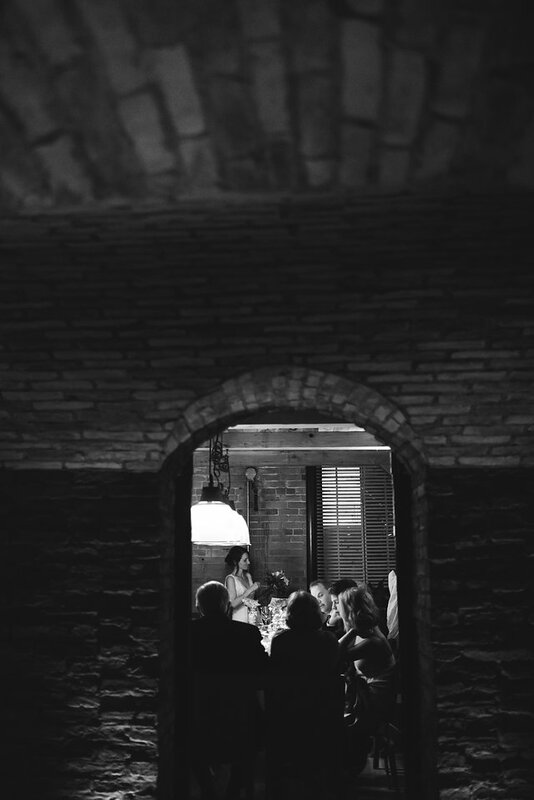 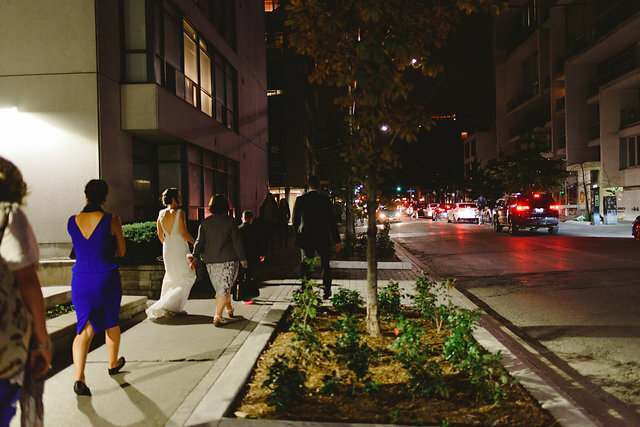 After the ceremony they walked to CIBO Wine restaurant for dinner. 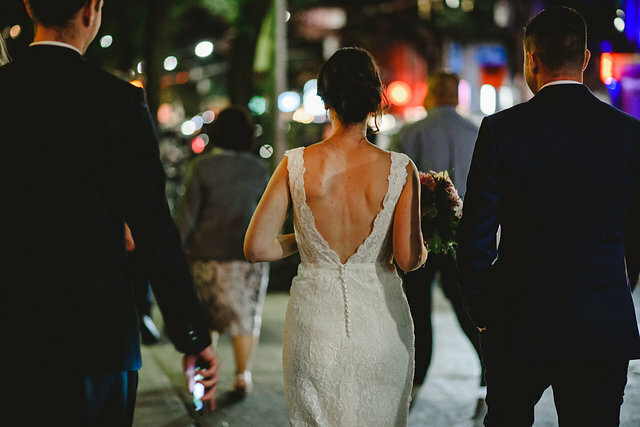 People passing them by on the street yelled their congratulations and Elisa laughed realizing how funny it must be to see a bride walking on the streets of downtown Toronto. 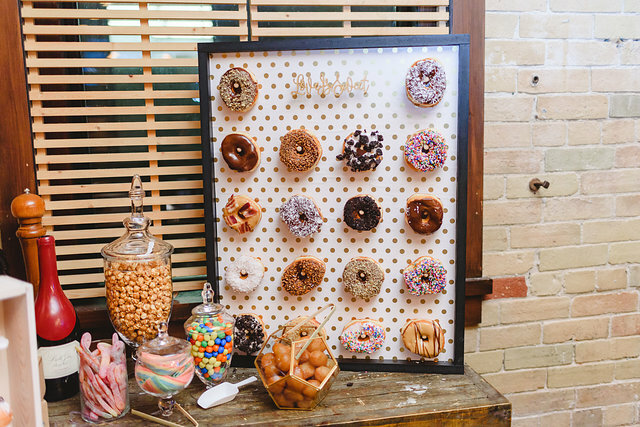 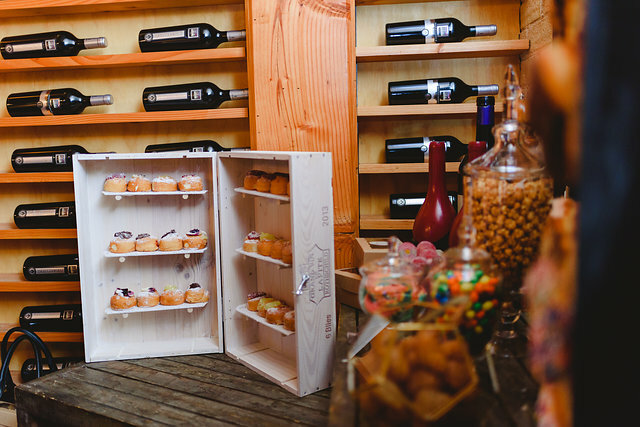 At the Italian wine restaurant they set up a sweets table with a donut wall and Italian sweets. 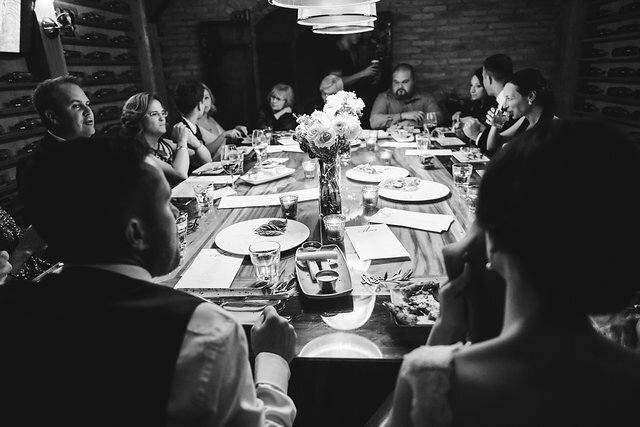 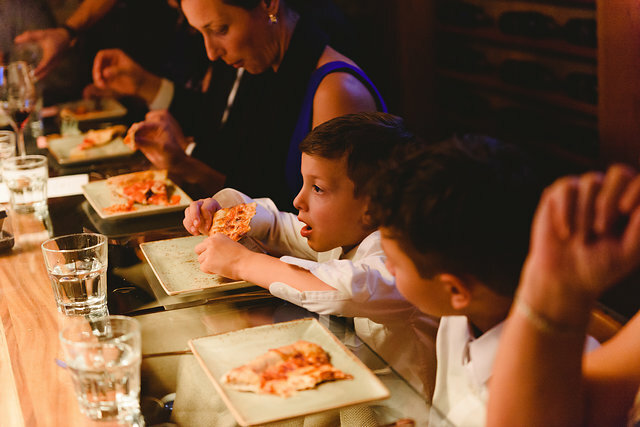 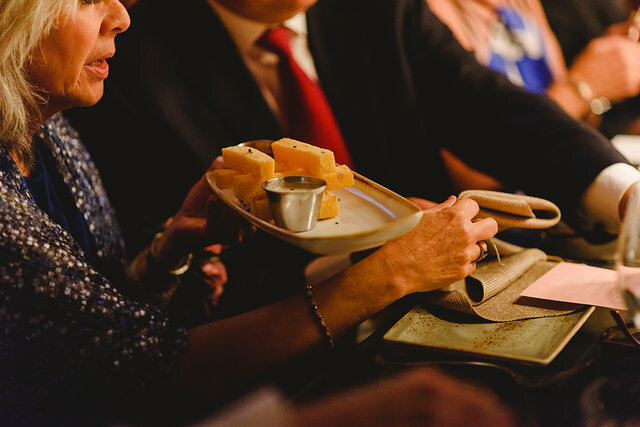 Pizza and wine quickly arrived for the hungry group and the room went quiet as the guests made a toast to the Bride and Groom. 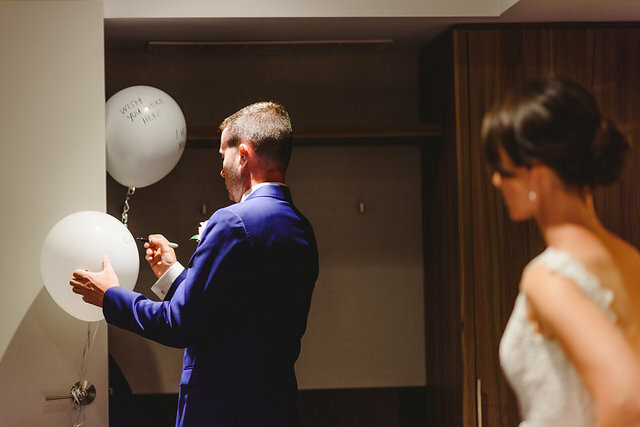 What a great memory of the day! 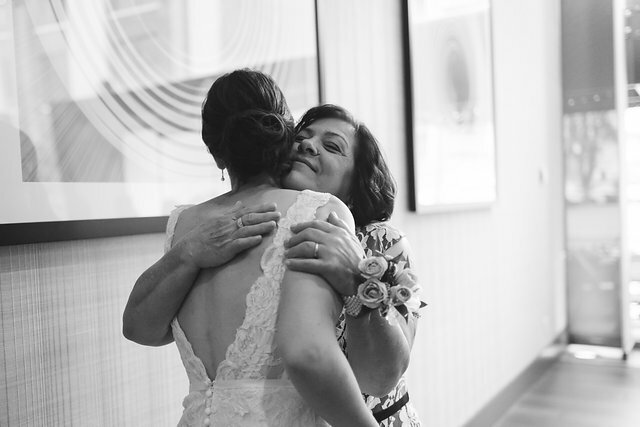 We couldn’t be happier with everything you did. 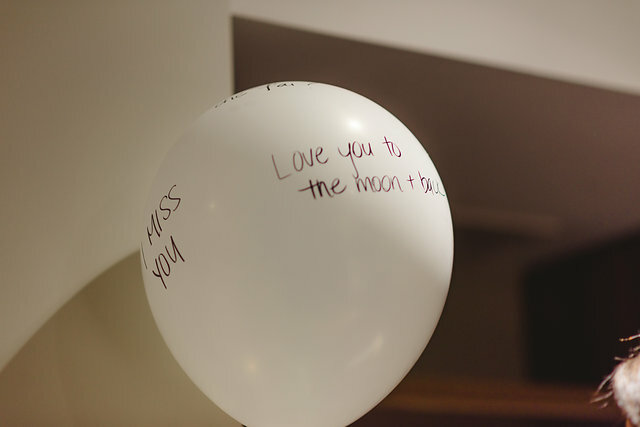 THANK YOU Jessilynn!